Until the collapse of the socialist system in Mongolia in 1990, Mongolian social sciences was fundamentally schematised in accordance with the prevailing political ideology of socialism, considering the country's history in the theoretical framework of historical materialism, the theory of socio-economic formation, and the feudalism model. 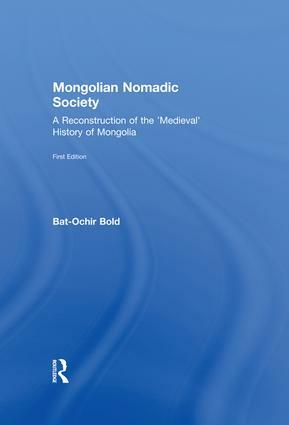 Here, however, the author adopts a fresh approach and criticises the theoretical adaptation of the feudalism concept to nomadic culture while treating the history of Mongolia in view of the structural and developmental particularities of nomadic society. The book shows the economic conditions and everyday life of mobile livestock keeping, tribal and political-administrative organisation and the social strata of nomadic society during the 13th-19th centuries, demonstrating that development of nomadic societies in Central Asia cannot and should not be evaluated in accordance with European norms.